When Softros LAN Messenger is started by a user whose user ID is identical to the ID of a user already signed into the program, the latter sees the following message in their user list. 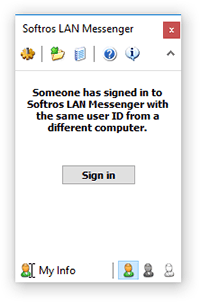 Clicking Sign in reconnects Softros LAN Messenger and simultaneously causes the same message to show up in the list of the user signed into the program later. The identical IDs are indicative of the computers being part of a domain and logging in under the same user account. If you would like to avoid such behavior of Softros LAN Messenger, please download and run a special VBS script in each of the problem accounts. The script is available on our website.